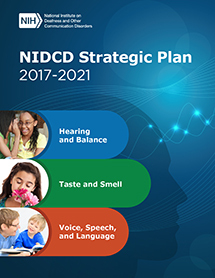 The NIDCD is the nation’s leading funder of biomedical and behavioral research and research training in these seven areas of communications and related disorders: hearing, balance, taste, smell, voice, speech, and language. The Institute also supports research and research training related to disease prevention and health promotion; addresses biomedical and behavioral issues associated with communication disorders; and supports work on devices that substitute for or improve sensory and communication function. Through our extramural research program, approximately 81 percent of our research budget supports scientists and laboratories at universities, hospitals, and other organizations nationwide and around the world. Descriptions of our scientific program areas, workshops, and grants management and administration. Application procedures, guidelines, frequently asked questions, policies, deadlines, and more. Search FOAs and Notices in the NIH Guide for Grants.